A fixed jackpot will consists of a fixed amount of money (e.g. $50,000) or a fixed amount of coins (e.g. 10,000 coins). If you win a jackpot consisting of a certain amount of coins, the value of that jackpot will depend on the coin value you set before commencing play. Example: You set the coin value to $2 and spin the reels. 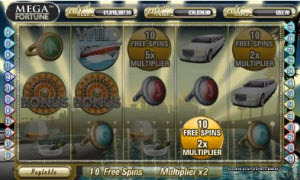 You get the jackpot combination on an active payline and is awarded with the 10,000 coin jackpot. The value of your jackpot is $2 x 10,000 = $20,000. If you had set the coin value to just $0.01 the value of your jackpot would be no more than $0.01 x 10,000 = $100. On some slot machines, winning the jackpot (fixed or progressive) is only possible when wagering the maximum bet or at least the maximum amount of coins. A progressive jackpot is a jackpot that will grow until it pays out. Exactly how a progressive jackpot is fed varies. Some progressive jackpots are fed by a percentage of each wager on the slot, while others are fed only by max bet wagers. For a complete feed of current casino jackpots, visit www.spelaspel.se/casino/. Slot machines with a progressive jackpot will normally display the exact size of the current jackpot in a very prominent fashion. That way, you can always see exactly how much you stand to win each time you spin the reels. Most progressive jackpots will not be allowed to drop down to zero after a pay out. Instead, the casino operator or the operator of the jackpot network will seed the jackpot to entice gamblers to keep in playing. Some of the major progressive jackpots online are seeded with considerably amounts, e.g. €500,000 or even €1 million, to ensure a steady stream of players. Some progressive jackpots are tied to a certain machine, while others are fed by many slot machines in the same casino. There are also networked jackpots fed by players in multiple casinos. Online, these networks are typically run by major game developers, such as NetEntertainment, Microgaming, Playtech, etc. Examples of slot games with famously large progressive jackpots that can be won online are Mega Fortune, Hall of Gods, Arabian Nights, Mega Moolah, MegaJackpots Cluedo, MegaJackpots Cleopatra and MegaJackpots Monopoly with Pass Go Bonus. Of course, progressive jackpots do not necessarily have to be linked to slot machines. Any type of game can have a progressive jackpot and there are plenty of examples of table games, scratch cards, bingo games, video poker games, and more that come with a progressive jackpot. When you play a game with a progressive jackpot, it is important to know that since the progressive jackpot needs to be fed, there will be less money available for other payouts. So, a slot game with a 96% payout percentage that is feeding a progressive jackpot will have less money to hand out in the form of ordinary wins compared to a slot game with a 96% payout percentage that doesn’t have to set money aside for a progressive jackpot – provided of course that both slot games receive the same amount of wagers.